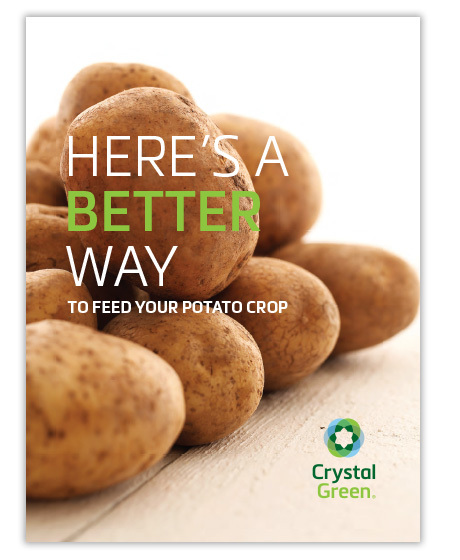 Crystal Green® is the first continuous release granular fertilizer to provide Root-Activated™ phosphorus, along with nitrogen and magnesium (5-28-0 with 10%Mg), to feed potato plants all season-long from tuber initiation to maturation with one application. Unlike conventional water-soluble phosphorus fertilizers, Crystal Green granules use a citrate soluble mode of action activated by organic acid production. As the roots produce citrates, Crystal Green responds with a healthy release of phosphorus, fertilizing potatoes on demand. 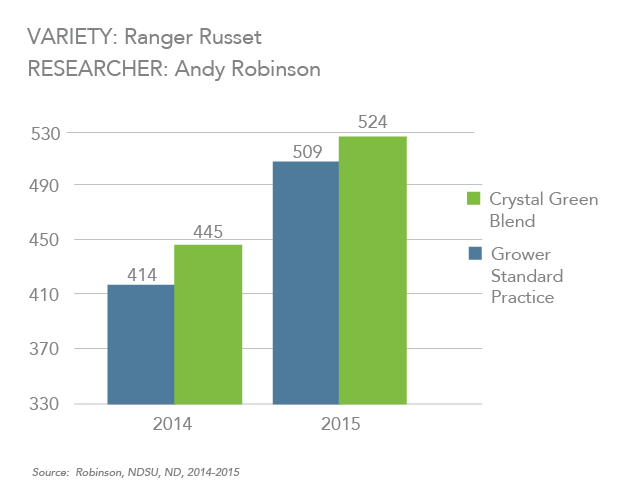 As plant demand decreases, nutrient release from Crystal Green is reduced, minimizing excess phosphorus in the soil and lowering the risk of tie-up. Crystal Green provides the nutrients your potato plants need all season long. Minimize phosphorus tie-up and crop nutrition challenges with one season-long application of Root-Activated™ phosphorus. Just use Crystal Green granules in combination with your conventional phosphate fertilizer as part of a blend. Crystal Green fertilizer optimizes phosphorus availability by consistently providing potatoes with the phosphorus they need, when they need it, through its unique Root-Activated™ mode of action. All with no additional labor or worry. The release of superior phosphate nutrients promotes a healthy, dense root mass and a vibrant canopy of lush green leaves. At harvest, well-nourished plants can result in a substantially increased marketable yield in your fields. Crystal Green provides a continuous release of nutrients to potato plants when they need it throughout the growing season. 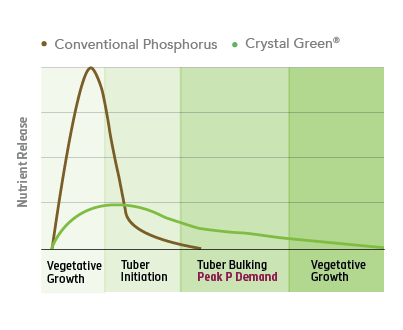 Crystal Green optimizes phosphorus availability by consistently providing tubers with the phosphorus they need, when they need it most. This produces higher marketable yields in a premium potato crop. 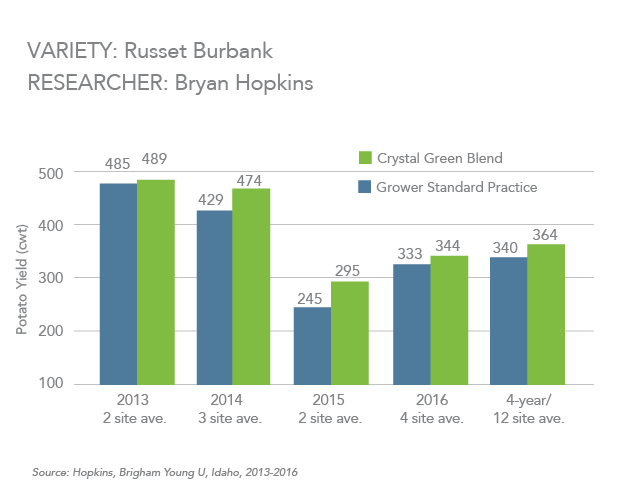 Since 2006, Crystal Green has undergone rigorous industry and university trials to track and refine its continuous release abilities, performance, and purity. 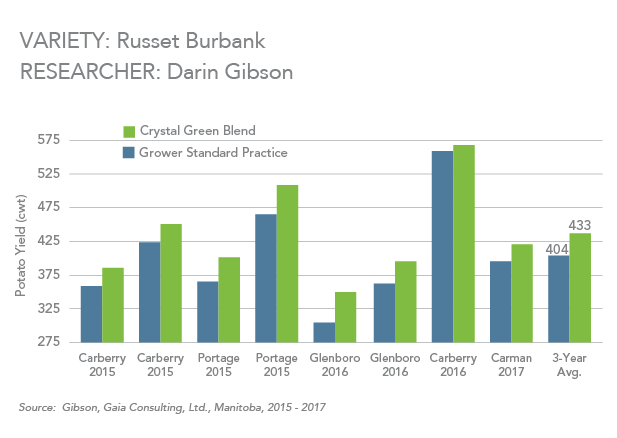 Top research shows that blends with Crystal Green outperform blends with only conventional phosphorus fertilizers, like monoammonium phosphate (MAP) or diammonium phosphate (DAP), for increased marketable yield. 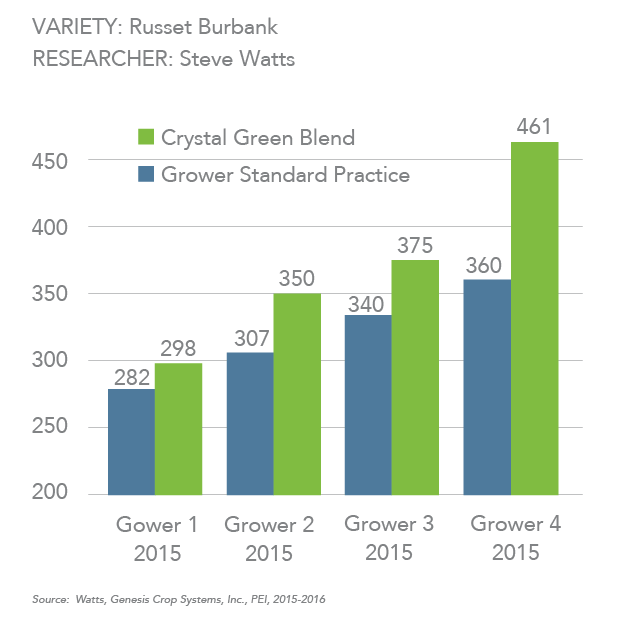 Additional trials by university crop scientists and commercial fertilizer distributors have also verified Crystal Green performance. 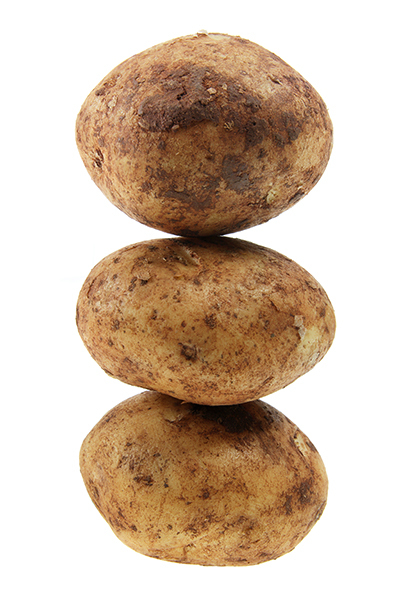 Crystal Green is the only Root-Activated™ product on the market today that supplies both phosphorus and magnesium (and nitrogen) in a continuous release form, allowing you to supply P2O5 and Mg to your potato crop in the best, most efficient way: one season-long application.